Where is Blue Green Algae? With so many places in Florida to explore, we sometimes forget our beaches, lakes and rivers are natural places that change with the seasons. 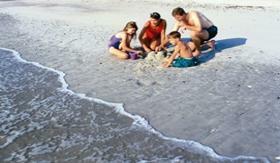 Enjoy Florida’s wild and not-so-wild areas, and know when to swim it, shore it or dodge it. Florida features 1,200 miles of coastline, 11,000 miles of rivers, streams and creeks, 7,700 lakes and more large springs than any other state. The Florida Department of Health (DOH) works to keep these waters safe from harmful algal blooms (HABs) and their toxins (or poisons). This work helps keep people safe from HABs when they play in or near water bodies or when they eat Florida seafood. DOH provides education to the public, as well as the health care workers who serve them, to prevent and reduce illnesses caused by HABs. Florida's Poison Control Centers and DOH in the counties report HAB-related cases to the Department. We also review hospital information to find new cases of illness. We work to see if HABs caused them. DOH works with neighborhood groups, local health departments, and any group who wants to learn more about HABs. We also teach people how to avoid contact with HABs. DOH provides research-based information to residents and visitors, health care workers, as well as other people who want to know about the health impacts HABs may cause. We help people make informed, healthy choices to be safe while playing near or in water bodies and when eating local seafood. Red tides, also called harmful algal blooms, occur worldwide. In Florida, naturally occurring, microscopic alga cause most red tides. A red tide means there is a higher-than-normal concentration of organisms present. This information card gives facts and contact information about red tide events in Florida. This fact sheet answers frequently asked questions about Red Tide. This poster describes the types of fish that have been associated with eating ciguatera. Blue Green algae, also known as cyanobacteria, occur all around Florida and the world. Many are single celled. Some may produce chemicals that can harm humans and animals. ILLNESSES related to aquatic toxin exposures or harmful algae, call the Poison Control Hotline at: 1-800-222-1222. RED TIDE: Information on Red Tide locations in Florida can be found at the Florida Fish and Wildlife (FWC) website or by calling 866-300-9399. Mote Marine Laboratory also provides information on red tide at 941-232-2437. *Note: This page contains materials in the Portable Document Format (PDF). The free Adobe Reader may be required to view these files.